Wash and Soak all the dry fruits properly and leave in sunlight a whole day to dry up. Chop washed and dried fruits and nuts and fill in a glass jar. Add brandy/rum in this and keep for 3 weeks. Try to soak it for a minimum of 1 week, at least. Shake the jar of soaked fruits once in a while. Combine ½ cup sugar and 1 tbsp water in a sauce pan. Heat it & let the sugar melt. When the color of the melted sugar becomes dark brown, remove the pan from fire and add 1/2 cup warm water to this. You need to be very careful at this stage since the water tends to splash and can cause burns. Bring it back to the heat and boil for 3-4 minutes. Remove from fire and let it cool completely. Grind all the spices with a pinch of sugar, to a fine powder & keep aside. Preheat the oven at 180 C for 10-15 mins, before baking. Drain the soaked fruits and keep aside. Retain 4 tbsp from the drained liquor. Toss the drained fruits in 2 or 3 table spoon of maida (All purpose flour). (This will prevent the fruits from sinking to the bottom of the cake). Sift the plain flour with baking powder and baking soda. Separate the yolks and white of the eggs. Beat the egg yolks and add the softened butter to it. Beat it till it forms a smooth paste. Add powdered sugar to this, gradually. Beat after each addition. When it becomes smooth add vanilla essence and cooled caramel, spice powder and jam. Beat again. Add the sifted flour in 2 batches. Add the drained liquor. Beat after each addition. Now clean the blades of the blender and wipe neatly. (Not even a drop of water is allowed while beating egg white). Beat egg whites till soft peaks form. Fold the fluffy egg white into the batter very gently. Make it two three parts and fold accordingly. Then fold in the soaked and coated fruits. (Do this part very carefully, do not mix for too long, Just two or three folding is enough for the dry fruits just to disappear in the batter). Grease the baking dish and line with baking paper. Pour the batter into the prepared tins. Bake in the pre heated oven for 40-45 minutes or until the skewer inserted comes out clean. The baking time can vary depending on the oven and also the size of the tin used. Soak 3 cups of fruits in 1.5 cups of fresh orange juice. Leave it overnight at room temp. The rest of the recipe is same. Using this recipe, I have got 1 Kg and 350 grams of plum cake. I adapted this recipe from mariasmenu. Thanks maria for such a lovely and yummy recipe. Need more cake recipes? Dont worry, try these. Recipe for preparing Pistachio Walnut Cake at home. 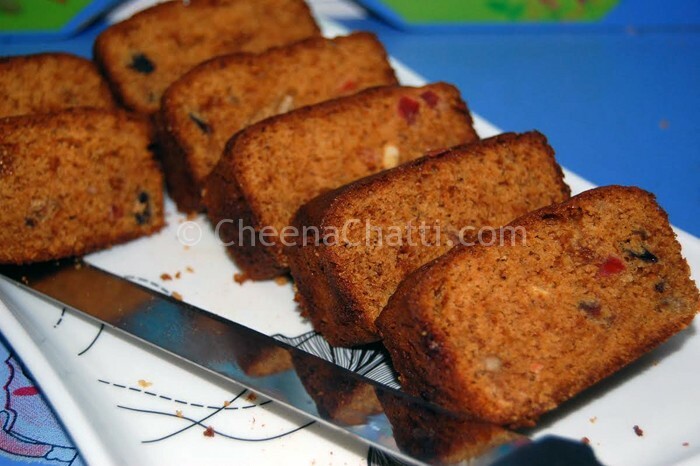 This entry was added on December 29th, 2013 by Athira Sooraj in Bakery and tagged with plum cake recipe indian, Christmas cakes, fresh plum cake recipe, Xmas cakes, cake, plum cake recipe kerala, christmas plum cake recipe, easy plum cake recipe, cake recipes. Last revised on April 4th, 2018. I like alcohol free plum cake. The minute we heat to 65 deg and above, alcohol evaporates 100%. Don’t add after baking. Tried the recipe turned our very well. Taste was pretty good and very close to what we used to have in Kerala. lovely recipe, but i have a question. When i soak the dry fruits in rum or brandy, i need to soak it for 3 weeks, right ? then do i need to soak the same in orange juice for only over night ? You don’t need to soak it again in orange juice. You can either soak it in rum / bandy for 3 weeks or can soak in orange juice overnight and bake next day. If you do not want soak in rum or brandy……you can use dry Maida instead of rum or brandy. Thank you for this wonderful recipe. The cake tasted very yummy. but my caramel turned bitter when i tried it make more brown. how come I make the perfect caramel sweet and brown? Would it be fine to use brown sugar instead of caramel?